Snow is likely to start Saturday afternoon and continue into early Sunday. Overall weekend totals are likely to stay in the range of 4-7 inches for most of the D.C. metro area and points north. The Monday morning commute looks dry, but there could still be slippery roads leading to school delays or cancellations. Editor's Note: See the latest forecast here. The storm that Storm Team4 has been watching all week is on track to dump several inches of snow on the D.C. area this weekend, prompting the National Weather Service to issue a winter weather advisory and a winter storm warning across the region. Storm Team4 expects the D.C. metro region to see 4-7 inches of snow. Areas to the south and west could see up to 8 inches, Chief Meteorologist Doug Kammerer says. At 4 p.m. Saturday, a winter weather advisory is set to go into effect of D.C. and areas including Arlington, Montgomery, Fairfax and Prince George's counties, as well as the City of Alexandria. That advisory is set to end at 7 a.m. Sunday. A winter storm warning goes into effect at 4 p.m Saturday for Charles, Fauquier and Prince William counties. That warning is set to end at 1 p.m. Sunday. But the forecast is still evolving. Stay tuned, as these snowfall totals may change. There's much more uncertainty about Sunday's piece of the storm. Current trends indicate that this second wave will be focused on the southern half of the region, meaning that Charlottesville, Richmond, Fredericksburg and southern Maryland would have a greater chance at seeing a few additional inches than spots such as Baltimore and northern Maryland. All this will come to an end Sunday night, and the Monday morning commute looks dry. There could still be slippery roads leading to school delays or cancellations, but the overall impact on Monday doesn't look too extreme. 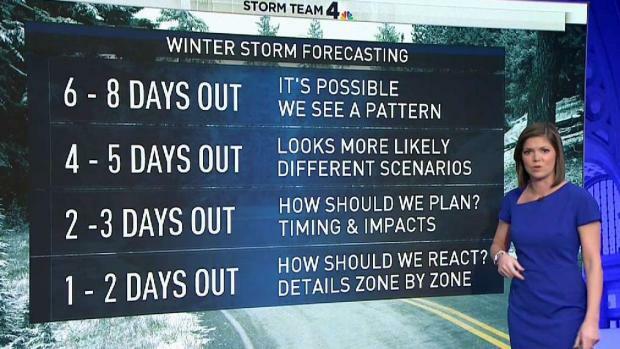 How Far Out Can Meteorologists Predict a Snow Storm? A weather app says your area will get a foot of snow more than a week from now. Can you trust it? Storm Team4 Meteorologist Amelia Draper shows how much meteorologists can know about a storm when it's eight days, five days or two days away. By Saturday morning, clouds will begin to build, and snow is expected around noon. It will be a cold day with a high of only 32. This likely will be the longest stretch of winter-like weather we've seen so far this season as the cold stretches all the way through next week. The News4 Telemundo 44 Health & Fitness Expo is this Saturday and Sunday. We recommend taking public transportation to the free, weekend-long event.